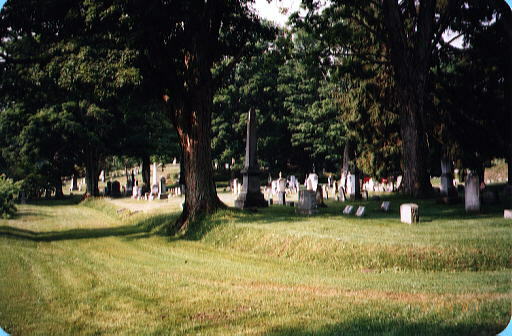 This is just a partial listing of burials at the Riverside Cemetery in the City of Oswego, and was generously donated by Sue Wilson, who has many Beardsley ancestors buried here, including her gx3 grandfather, Samuel Raymond Beardsley, Col. of the 24th NY Regiment. Sue has sent in two pictures of his Civil War memorial at Riverside Cemetery. If you have any names you would like to contribute to this cemetery list, please email the coordinator here. For more information on any of the names, please contact the local Town Historian or Historical Society. * Note: 10/22/01It has been brought to my attention that though this cemetery is often considered a city cemetery for Oswego, Riverside is more accurately located in the town of Scriba. For those of us who know, it isn't a problem, but so many people don't know that. 11/01 Additional Names Added to this list. 7/03 Additional names contributed by Sue Wilson. Baynes, Jennie F., b. Scriba, N. Y., July 29, 1850; d. Scriba, N. Y., Apr. 5, 1874. Beach, Mrs. Sophia Olivia D., wi?e o? Samuel B. Beach; d. May 15, 1815. CP Rem. fr. 5th Ward Cem. Nov.30, 1889. Beardsley, Edward Christian, b. Oswego, N. Y., June 8, 1855; d. Oswego, Jan.19, 1856. Beardsley, Elizabeth Raymond, wi?e of Levi, b. Hoosick, N. Y., Sept.?6, 1790; d. June 7, 1864. Beardsley, Levi Macy, b. Oswego, N. Y., Jan. 22, 1856; d. Oswego, N. Y., Apr.27, 1857. Beardsley, Samuel Addison, b. Aug.28, 1852; d. June 10, 1893. Memorial of Samuel R. Beardsley, Col. 24th N. Y. Vols. Beattie, Arabella, b. Ireland, June 9, 1799; d. Hannibal, N. Y., May 7, 1835. Beattie, Elizabeth, wife of John, b. Nov.28, l806; d. Oswego, N. Y., Dec.25, 1866. Beattie, Nelson, b. Ireland, Sept. 2, 1815; d. Oswego, N. Y., Apr. 12, 1883. Beattie, Sarah H., b. New Orleans Dec.25, 1840; d. Oswego, N. Y., Jan. 31, l864. July 2003 by Sue Wilson. I would like to contribute another partial listing of burials in Riverside Cemetery, that I obtained from the Oswego Historian. My Gx4grandparents, were Christian Jacob ? Charlotte Elizabeth Seitz BURCKLE. Note: My Gx5 Grandfather, Charles Adolph SEITZ, served in the Rev. War as a 2nd Lt. 3rd PA Regiment. 1776-1779. He also served under George Washington's Army at Valley Forge, 1778. BURCKLE, Christian Jacob, b. Goppingen, Germany, 1781; d. Oswego, NY, Oct.
BURDICK, Louise E., b. Oswego, NY, Feb. 11, 1854; d. April 22, 1876. BURDICK, Mabel, d. July 25, 1870, age 5 days. Parents: Harvey J ? BURDICK,___b. Oswego, NY, Aug. 30, 1859; d. June 21, 1860. Parents: Harvey ? Frances Burdick. BURKE, Alvin, b. Rome, NY, Sept. 26, 1817; d. Oswego, NY, Sept. 2. 1873. BURKE, Jessie I., b. Volney, NY, Mar. 12, 1870; d. Volney, Jan. 15, 1881. BURLEIGH, Mrs. Ann, b. Kinderhook, NY, July 21, 1800, d. Scriba, NY, Feb. 22, 1886. BURR, Mrs. Elmira, b. Jefferson Co., NY, Jan. 20, 1826. d. Oswego, NY, Aug. 28, 1886. BURR, Freddie, d. Watertown, NY, Nov. 6, 1873, age 2 yrs. Parents: O. W. ? A. J. Burr. BURR, Ina May, b. Oswego, NY, Feb. 4, 1875; d. March 5, 1877. Parents: John M. ? I have some more people to add to your list. NOTE: Large Buske Tomstone to the left when facing small markers to the West. The parenthesis above are my additions.